On the most southerly outskirts of San Francisco, far away from the subsidized counterculture of the Haight and the boho hustle and bustle of The Mission District, lies the sprawling, unsightly mass of asphalt and concrete known as The Cow Palace. 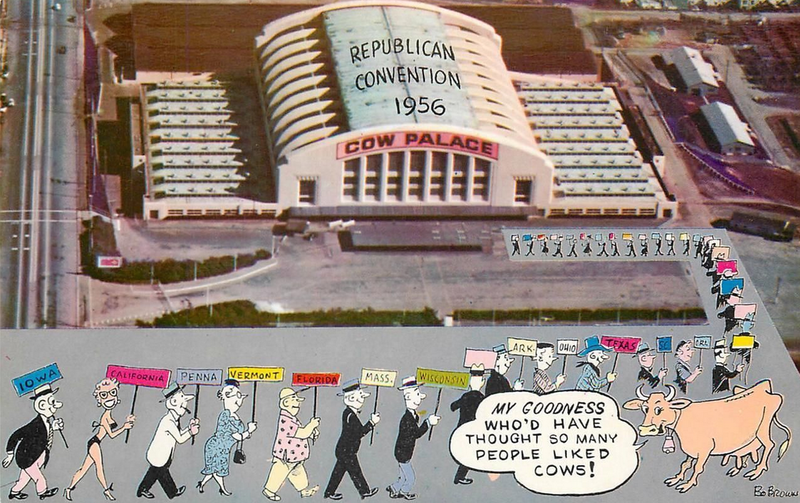 Originally constructed in the 1940s as part of a Works Progress Administration project to serve as a stadium venue for hosting livestock expos, The Cow Palace may be one of the dullest pieces of Art Deco architecture ever created. With its wide, squat base, barrel roof and drab exterior, it reminds one more of a airport hanger or an oversized bread box than an indoor arena. Today, The Cow Palace has been relegated to the minor league purgatory assigned to all stadia that have been replaced by larger, more technologically advanced monstrosities, but are too stubborn to implode. With that being said, The Cow Palace was at one time one of the nation’s premier arenas, serving as the home for the Golden State Warriors in the 1960s, playing host to The Beatles on the opening night of their inaugural North American tour and, most importantly, holding the Republican National Conventions in 1956 and 1964. The Republican National Convention in 1956 was a gay affair, filled with delegates and galleries brimming with joy at what was more coronation than nomination. After ushering in the end of the Korean War abroad and overseeing an unparalleled level of prosperity at home, Dwight D. Eisenhower was one of the most popular Presidents in modern history. Not everyone liked Ike, but those that did far outweighed those that didn’t and members of the GOP were justifiably confident in their chances in a rematch against Democratic challenger Adlai Stevenson, despite the fact that the Republican majorities in Congress were razor thin. The GOP in 1956 bore little resemblance to the GOP of today, and looking back at the 1956 Republican platform is enough to make a liberal or a moderate weep. On everything from the minimum wage and labor rights to social security and equal rights, the GOP’s official position could be classified as somewhere between moderate and progressive. In his nomination speech at The Cow Palace, Eisenhower told the assembled party faithful that principle states that, “Free collective bargaining without government interference is the cornerstone of the American philosophy of labor-management relations” words which would get him swiftly excommunicated from the Republican Party of the 21st century. Later on in his speech, the 5-star general and former Supreme Commander of the Allied Forces in Europe let the nation know how desirous he was of further conflict, saying, “no one is more aware than I that it is the young who fight the wars, and it is the young who give up years of their lives to military training and service. It is not enough that their elders promise ‘Peace in our time’; it must be peace in their time too.” Any Republican today who dared to openly promote collective bargaining and advocate peace in the midst of a nebulous global war that could easily be exploited for political gain would be promptly excommunicated. But, in the 1950s, politics had not been polarized to the degree that it is now, and a pragmatic moderate like President Eisenhower was free to extoll the virtues of certain New Deal programs while trying to reform others to better reflect his conservative belief in the efficacy of smaller, decentralized government. Fast forward 8 years and the group of right-wing ideologues and reactionaries who assembled in The Cow Palace would be instantly recognizable to any of us as the forefathers of the contemporary Republican Party. If there is a year zero for the vast conservative regression that has consumed the GOP and rendered null and void anything approaching bipartisan compromise in Washington, it would be 1964. It was in this year that the Republican Party nominated Senator Barry Goldwater of Arizona as their candidate for President, opening up a Pandora’s box of zealotry and unreason that not even Mr. Conservative himself would be able to stop in the years to come. 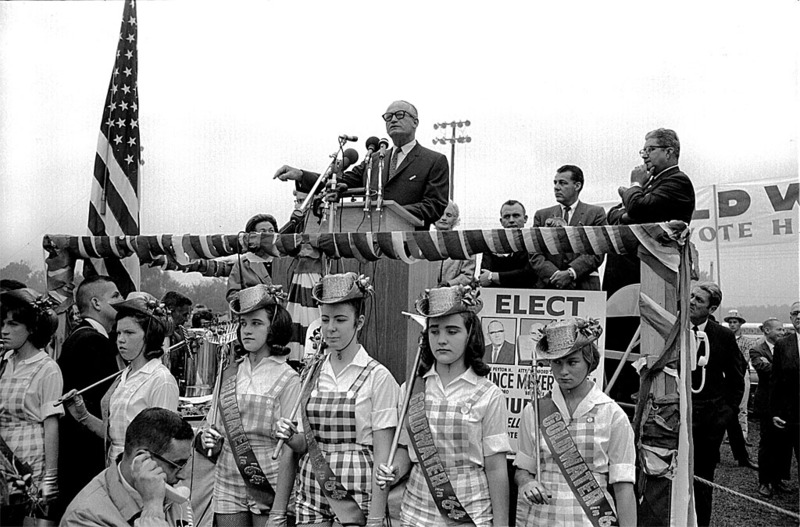 At the time, Goldwater and his rabid following full of John Birchers and budding Reaganites were seen by the national press and much of the political world as a dangerous aberration—an accident of electoral politics that was doomed to failure and repudiation by an American public that would never endorse such brazenly bigoted and anti-labor views. That speech, to steal a line from Winston Churchill, was the end of modern conservatism’s beginning. However, at the time, common wisdom had it that the Goldwater campaign was more akin to the beginning of the end for the nascent conservative movement that took hold of the Republican Party in 1964. Goldwater was throttled by LBJ in the general election, only picking up 52 electoral votes and earning the ignominious distinction of being 1 of only 2 mainstream presidential candidates in the post-WWII era to lose the popular vote by a margin of more than 20 percentage points. Down the ticket the results weren’t much better, with the GOP losing 2 seats in the Senate and 36 seats in the House to give a the Democrats an overwhelming supermajority in Congress. The people had spoken and they had flatly rejected Goldwater’s conservative extremism. And yet, 50 years later, Goldwater’s radically reactionary views are now the accepted gospel of the GOP and most of the liberal reforms of The Great Society and the Civil Rights Movement are under attack by conservative judges and legislatures at both the Federal and state levels that are overflowing with right-wing zealots aching to prove their ideological purity. How could this have happened? Well, to answer that question we need to take our attention away from the 44 states that Goldwater lost, and concentrate on the 6 that he won. We need to examine the origins of the strategy he stumbled into and how it flipped the political world upside down. We need to go down South. * Next week, I will post an a follow-up article to this one, focusing on the genesis, ideological underpinnings and lasting effects of the “Southern Strategy” that Goldwater ushered in as the bedrock of the GOP ‘s electoral agenda over the last half century. (1) Many of the anecdotes from the Goldwater campaign included in this article come from Theodore H. White’s book, The Making of The President—1964, which isn’t available for free viewing online. If you want to read more about the ’64 campaign, you’d be hard pressed to find a more well-written, albeit hardly bias-free, account of the election.